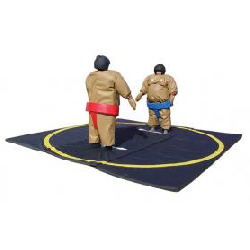 Did you ever imagine what it would be like to be a 400 pound Sumo Wrestler? Well here is your chance to do battle! Don't try tackling your friends without your Sumo suit on. Rental includes mat, headgear, gloves and padded suits. Dimensions: 14' W x 14' W x 2'' H. Please allow 17'L x 17'W space for adequate clearance.